Noggin, the commercial-free, educational network from Nickelodeon and Sesame Workshop, will launch a live version of its new, interactive preschool series "Play with Me Sesame.'' The ``Play with Me Sesame'' mall tour will travel to nine cities beginning in April 2002, stopping at major shopping malls across the country. The tour will feature interactive songs and games from Noggin's new half-hour series "Play with Me Sesame.'' Each show stars Ernie, Bert and Grover walk-abouts and a live host. The characters will encourage preschoolers to participate in a 'play date' and play and sing along in the audience. Three 14-minute free shows will be performed in each city. "Play with Me Sesame'' will premiere on Noggin on Monday, April 1, 2002 and will air seven days a week at 9:00 a.m. ET/PT. "Play with Me Sesame'' is the anchor series on Noggin's newly- expanded preschool block. Play with Me Sesame, "the new half-hour interactive series, mimics a child's playdate, giving preschoolers lots of exciting ways to play along and participate with their favorite Sesame characters. 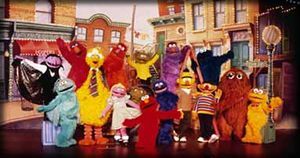 Each episode features classic Sesame Street footage mixed with newly created Muppet segments inviting children to engage in a specific activity. Ernie's segment, ''Ernie Says," (a la Simon Says) gets kids up and playing along right from the start. Bert invites kids to go online, creating oatmeal art, playing ''pigeon patterns" and matching and sorting socks. Prairie Dawn hosts an art show of kids drawings. Grover's ''Move and Groove with Grover," gets kids singing and dancing to classic Sesame Street songs. "Play with Me Sesame's'' participatory approach is aimed at helping preschoolers prepare for school socially, emotionally, and intellectually. The show's interactivity is designed to encourage social play, which is an important aspect of school readiness. Both on-air and online activities support children's creativity and individual expression. The activities stress the fundamental concepts of same and different, which are critical underpinnings of reading, math and science. Noggin, a joint venture between Nickelodeon and Sesame Workshop, currently reaches over 22 million households via cable, digital cable and satellite. With two distinct program blocks, "Noggin'' for preschoolers and "The N'' for tweens -- the network helps kids to figure out their lives with educational media on-air and online (http://www.noggin.com and http://www.the-n.com).